There were a couple of pictures this week that really got to me… really made me question the dark side of humanity and civilization. This was the one that got me the most, though. I have four kids. I can’t fathom the depths of the pain achieved from seeing the lifeless body of your child washed up on a beach. You shouldn’t have to have kids for your heart to break when you see something like this, but it certainly drove things home more for me because of that. A man lost his two beautiful, tiny children along with his wife. He said after he buries them, he simply wants to sit beside their graves until he dies. I can’t imagine feeling differently. Can you imagine how deeply terrifying life must be when a parent arrives at the decision to leave everything and flee their homeland? Can you imagine how helpless and hopeless a situation that would be, to know that your only option was to take your family and leave immediately, knowing that death for your children was a very real possibility whether you stay or go? Can you imagine, in this day and age, being forced to rely upon the decency, grace, and understanding of others in order for your family to have even a minescule shot at simply surviving? How did we become this? How did vilification of immigrants fleeing inhumane situations that posed an absolute risk of death and tortured lives become a ‘selling point’ for a political party? How did this become something in which pride was taken? Have you no shame at all? We are surrounded by these immigrants and their families every day in America. They are our friends, our co-workers, our soldiers, our firemen, our teachers… And yet we think nothing of calling them and their relatives thieves and rapists. We think nothing of considering them second-class citizens. We think nothing of denying them an inkling of humanity when they come to us broken, beaten, hungry… We think nothing of surrounding their buses with armed militias, saying ‘f**k you’, and sending them back into the nurturing arms of terror. Coming from the party that touts itself as embodying Christian principles, I can’t help but wonder… What would Jesus do? And yet we continue to send billions in aid to countries that despise us. We continue to bail out banks that sit back and laugh at us. Yes… because working fourteen hour days outside doing jobs Americans won’t do tends to qualify you as ‘lazy as hell’. Sometimes it’s difficult to get your Visa application in order while cartel gunmen are mowing through your town with uzis. I keep coming back to the Christianity thing… The opposing ideals here stand out like a sore thumb with Republicans. How can you read the teachings of Jesus, profess that your life is dedicated to following in the footsteps of Jesus, be saved by Jesus, and then point loaded AR’s at terrified fleeing families seeking a better life, or at least a shot at one, and demand they they get the f**k out of your country? And then, to take things to an alarmingly low level, address them as animals from the campaign stage. How did you get to that place? How did that much hatred manage to seep into your heart, where you force fellow humans in need back into the dark nightmares from whence they came? And why does it not sicken you like it does me to thump your chest at this astonishing lack of compassion? Is it time we take down the Statue of Liberty and replace it with a wall and a ‘Keep Out!’ sign? Nearly every one of us in America is either an immigrant or a child of an immigrant that came here seeking the same opportunities as these people. Why does nearly half our country not see the glaring, sad irony of that? I’m not saying I have the answers here, but I know what the answer is not. It’s not staring at a picture of the lifeless body of a child washed up on a beach, then sending folks to build a wall at that beach so that we don’t see problems wash up there anymore. 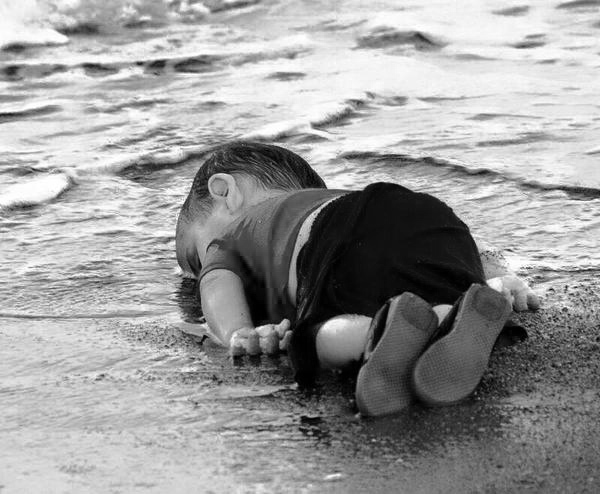 The life of that Syrian child is worth no more than the life of a Mexican child, and no less than an American child. It’s wonderful to take pride in your country, as I do… but the fact is, Jesus never mentioned America. And I’m not particularly religious, but Jesus was a good dude. He said to take care of the least among us. Not the white least among us, the Christian least among us, or the legal least among us. Just the least among us. Perhaps someday, Republicans will stop waving that book above their heads or hiding behind it, set it down, and see what it has to say. WE….ended slavery, ended Imperial Japan, defeated Nazi Germany, were the first people in Haiti after a major earthquake, we are a country of freedom and liberty which is guaranteed us through a document that not only shaped this country, but should be held in highest regard still. We are bound by law…found in that document; and if we allowed every person to enter this country willy-nilly, then we are no longer a sovereign nation. This child is not dead because we do not allow immigration (there is a legal process for it). Yes, it is a horrific image; however, appealing to people’s emotions is not only illogical, but has no bearing on the law. This has nothing to do with politics until you start the discussion about who is attempting to destroy that document that provides this country with not only its indelible identity, but its specific freedoms that most there countries do not have. You should think twice before generalizing, labeling, and trying to use God as an excuse for political persuasion. I appreciate your reply. This blog was written as a response to the stark contrast between Republican candidates for President claiming to be devout Christians, and their willingness to turn away people in need at gunpoint. They brought God into the discussion. I simply pointed out the hypocrisy and total lack of compassion. Like your story but are you putting a label on one group of people, Republicans? You are saying we are all alike. Let’s all get along with one another for the good of the world. No one should be judging an individual but God. Every child including the unborn is precious. Repulsive Comments from Trump, against mexicans!